Because it’s the beginning of the year we are receiving a lot of calls from students who are looking to do an MYOB Course so we are thrilled to confirm that we offer access to ALL of our MYOB Courses for one low price and 12 months course access. MYOB Advanced Payroll Administration Course. Why All MYOB Courses for One Price? We can guarantee consistent course content to every student, with MYOB Course content developed over 15 years in teaching people how to use MYOB and from some of the best MYOB Trainers in Australia. By creating our own MYOB courses and updating them we are able to focus on the content of our courses as well as the systems to support it online rather than paying for office rent, computers and software licences, trainers and advertising. The only decision you need to make is whether you want an MYOB certificate and 12 months or lifetime course access. Remember that unlike some MYOB course providers our students can move freely from one course to the next as they please and use the course as a resource while at their new job or operating their own bookkeeping business. With a 100% focus on MYOB Course content we create every form of training material for MYOB accounting software: Videos, Workbooks (with step-by-step exercises) and Knowledge Reviews that test your skills. You can watch a video and try to replicate it with the free MYOB software or follow the exercises in the MYOB Trainingg Workbooks to perform tasks that bookkeepers perform every day in their working environment. 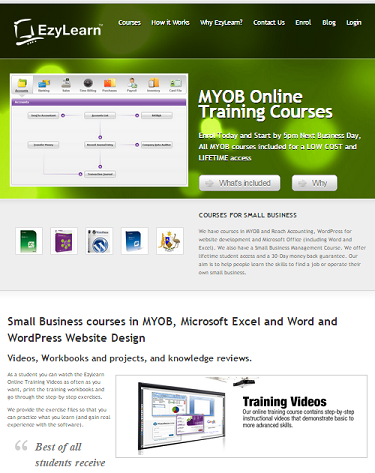 When we were the first training company to offer MYOB courses online in 2008 we offered the money-back guarantee because not everybody had great broadband Internet speeds, not everyone knew how to navigate around websites and online learning management systems and people where generally scared to use their credit card online. Now-a-days we find that the biggest reason some students find it a comfort is because many students are Mac users and are not sure that they would learn by using MYOB Course content created for the Windows versions of the MYOB software. We use the Content Marketing approach to building our brand and product awareness and it takes a lot of effort to put the amount of detail we put on our website and in our blog posts. We do it because it shows an ongoing commitment to openness but also to leave no doubt as to exactly what we offer and how we support it. If you want to get to know more about us read some of our blog posts or watch some sample videos. If you are ready to enrol into an online MYOB course then enrol now online and start by 5pm next business day! Did you remember receiving that blog post about us looking for a person to work with us doing office admin in Chatswood? Michelle, one of our MYOB course students, completed her Business Service Provider profile and fit the bill so we brought her in for interviewing. You might recall that we wrote about an MYOB course student who also created a website for her fathers business? It was Michelle! 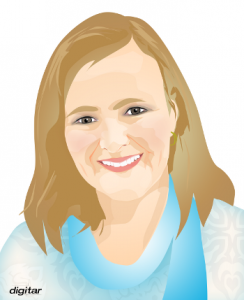 Michelle is a hard working mother of two teenage children and she has worked hard to learn new skills, while managing her fathers business, building it’s website and lots of other great things. 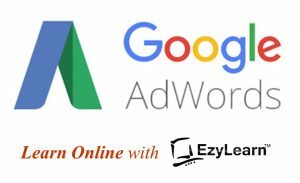 Michelle is now part of our team and she’s learning a lot of new things about how we operate our business, how we promote ourselves online and also how we use online marketing tools like Google. Most importantly I’m introducing her because she’s available to help current students get through their course as part of our Student Community and Tutor Support program to helps them in their journey to find MYOB jobs. But more than MYOB, Michelle is currently completing her Cert IV in Small Business Management with the aim of being able to help people start their own business or manage their existing business better. We’re revamping our Student Community and Tutor Support service to specifically focus on skills to help students find MYOB jobs and learn small business management skills and Michelle will be available to help students. MYOB jobs in Chatswood and Gold Coast. I was so impressed with the result of our search that I’m reaching out again. We are looking for another admin assistant at our Chatswood office and also in the Gold Coast area so if you live in these areas make sure you complete the Business Service Provider and tell us a bit about yourself. We prefer to work with students who have completed our course and understand how we operate our business so you get the first chance!